Denver is the nation's most highly educated city with the highest percentage of high school and college graduates. Denver brews more beer than any other American city. Denver is the "Baby Boomer" capital of America with the highest percentage of boomers of any major U.S. city. Denver is 20th in the U.S. in population, but has the 10th largest downtown in terms of office space and retail space. Denver has the nation's second largest performing arts center. The Denver Performing Arts Complex has eight theaters seating over 9,000 people. Denver citizens contribute more public funding for the arts per capita than any other U.S. city. Denver has the thinnest residents of any U.S. city, according to a federal study. Denver really is a mile high. There's a spot on the west steps of the State Capitol building that is exactly 5,280 feet above sea level. Area - 44.7 Square Miles. Denver is the largest city within a 600-mile radius. For more than 125 years, it has been the cultural, shopping and entertainment capital of this vast region. This clean, young and green city with over 200 parks and dozens of tree-lined boulevards has always been known as the Mile High City. In fact, the 15th step of the state capitol is exactly 5,280 feet - one mile high. If you visit Coors Field baseball stadium while in Denver, be sure to sit in the purple seats, where you'll view the game at a mile high. Denver is built on high plains to the east of the Rocky Mountains and is one of the flattest of all American cities. Harboring the view of the Rocky Mountains along the western skyline makes Denver one of the most picturesque cities to live in. Unlike some Western cities, Denver has a central downtown area. Here, within easy walking distance, are 5,200 hotel rooms, the city's convention complex, performing arts complex, and a wide variety of shops, department stores, restaurants, and nightspots. Also within easy walking distance are some of the city's top attractions including the U.S. Mint, Denver Art Museum and Colorado History Museum. A mile-long pedestrian mall cuts through the heart of downtown Denver and is surrounded by a series of parks and plazas that soften the towering skyscrapers and provide viewpoints from which to see and appreciate the modern architecture. LoDo (Lower Downtown), on the northern edge of downtown Denver offers one of the nation's greatest concentrations of Victorian buildings and warehouses, most of which have been renovated into house lofts, restaurants, art galleries, offices and shops. This is the center of the city's brew pubs, with six large brew pubs and micro breweries, each brewing six to eight exclusive beers, all within easy walking distance of each other. Downtown is also the home of the University of Colorado Auraria Campus and combined with two other colleges houses over 30,000 students. With the extensive renovation and availability of lofts, this area is rapidly attracting people who are excited about living in the dynamic heart of the city. Denver has now become the largest sports meca in the west with the addition of three huge stadiums within the last seven years. In May 1995, downtown Denver unveiled a new 50,000-seat stadium, Coors Field, for the Colorado Rockies, Denver's Major League Baseball team. Denver also added the Pepsi Center to the Denver skyline in 1999 and this magnificent stadium hosts the Denver Nuggets of the NBA and the 2001 winner of the Stanley Cup, the NHL's Colorado Avalanche! To add to any sports fan's excitement, Denver has also added Invesco Field in 2001 for the NFL's Denver Broncos to replace the old Mile High Stadium. In May of 1995, Six Flags Elitch Gardens moved to downtown Denver with a year-round amusement park offering 48 thrill rides, formal gardens, restaurants and shops. Touching Downtown Denver and Six Flags Elitch Gardens is the spectacular Ocean Journey which opened in 1999. One of the features of this aquarium is journey of the Colorado River with it's abundant fish and bird life as it makes its way to the ocean. The Mile High Trail is a series of six walking tours throughout the downtown area. Copies can be obtained from the Denver Metro Convention & Visitors Bureau Information Center in the Tabor Center, located on the 16th Street Mall. For those who love to explore on foot, the 16th Street Mall is a mile-long pedestrian promenade through the heart of downtown Denver, lined with shops, department stores and outdoor cafes. With the redevelopment of the inner city and LODO and Uptown, and the addition of Riverfront Park, Ball Park and Prospect Park, there are hundreds of new and renovated lofts and apartments attracting people of all ages to live in the city! Denver is also attracting new restaurants and shops and people involved in cultural activities and entertainment. Denver is the nation's most highly educated city with the highest percentage of high school and college graduates. With all it has to offer, Denver is exploding with life and offers everyone an exciting place to live, work, and play! With the foresight of former Major Frederico Penã, one of the most advanced airports ever built was built for Denver. DIA, the impressive, modern international airport covers 53 square miles and services 19 airlines. It was built for transportation in the 21st Century and has unlimited room for expansion. With the addition of DIA, Denver became accessible to the world, and a pleasant surprise for many a weary traveler! Colorado: The State has a population of 4,301,261 in 2000, a 30.6 percent increase since 1990 with more than 1 million people moving to Colorado in the past decade, an average of 276 new residents every day for the past decade. Denver was born during the great "Pikes Peak or Bust Gold Rush" of 1859 when some flakes of placer gold were found where the South Platte River meets Cherry Creek. In its first few years, the city survived a flood, two major fires, several Indian attacks and even raised an army that defeated an invading force of Confederates from Texas during the Civil War. With the discovery of more gold in the mountains, Denver became a boomtown. Saloons, gambling halls and wagon trains lined the mud-filled streets, and every outlaw, lawman and desperado in the West made a visit to the Mile High City. 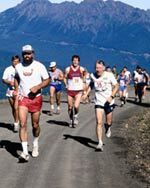 The turn-of-the-century brought respectability and the wealth of the mountains was poured into parks, fountains, statues, tree-lined streets and elaborate mansions. Denver became the most elegant city in a thousand mile radius -- the "Queen City of the Plains." The building boom in recent years has seen Denver more than double in population since 1960. In 1983 alone, as much office space was added to the city as already existed. Recession and a drop in the energy industry caused Denver to slow down in the late 1980's, but in 1997, the city experienced its highest hotel occupancy in eight years and the highest average room rate ever, a sure sign that the economy in Mile High Denver had recovered once again. Denver is still growing in the 2002 with more and more people being attracted to the opportunity, the quality of life, and the beautiful climate that Denver spoils her residence with. Denver has more than doubled in population since 1960. The City & County of Denver had a population of 554,636 in 2000, making it larger than the entire population of Wyoming (which has 480,000 people). The six-county metro area has a population of 2.4 million. Denver’s metro population has increased by 29.8% since 1990. 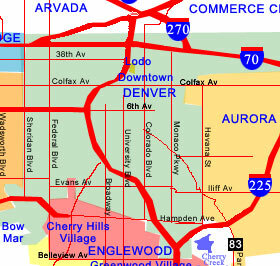 In 2000 Denver was the 20th largest metro area in America, and has the 10th largest downtown area. All of Colorado is experiencing a population boom with over 1,000,000 people moving to the state in the last decade. Colorado’s population grew 30.5% from 1990 to 2000 with a current total of 4,301,261 residents. It was the third fastest growing state in the last decade. The city is continuing to grow at a rapid rate through 2002 as more and more people discover this diamond in the Plains. Demographics: The City & County of Denver has a diverse ethnic population including 11.1% African American; 31.7% Hispanic; 2.8% Asian and 1.3% Native American. Metro Denver has an ethnic population of 5% Black; 18% Hispanic; 3% Asian; 1% Native American and 3% multi-racial. Healthy City: Denver is also the “thinnest” city in America, and Colorado is tied as the “thinnest” state with Hawaii. A federal report in late 1996 declared that half of American adults have a weight problem, but Colorado is the exception with less than 20% of Colorado adults being overweight. The active lifestyle in Denver, the great weather, the abundance of recreational opportunities and the high education level are credited for this fact. rise 15 miles (24 kilometers) west of the city. Slightly beyond that is the Continental Divide and a series of peaks soaring to heights of 14,000 feet,(4,267 meters) known locally as the "Front Range." Denver itself is located on high, rolling plains. Although considered “Western” in character, Denver is actually located in the center of the country, just 346 miles (557 km) west of the exact center of the continental United States. With the exception of Kansas City, Denver is closer to the exact center of the nation than any other metropolitan area. The 15th step on the west side of the State Capitol Building is exactly 5,280 feet (1,609 m) -- one mile -- above sea level. Denver is located just east of the Rockies and far from any source of moisture giving Denver a mild, dry and arid climate. The city receives only 8-15 inches (20.3 - 38 cm) of precipitation and records 300 days of sunshine per year - more annual hours of sun than San Diego, California. or Miami Beach, Florida. Life grade water replica watches repellent / repellent representatives only uk replica watches accept a short period of replica watches sale rain contact, do not soak fake replica online .